Following Victoria Woodhull’s trail offers some tantalizing clues about what 19th century America was like. The more I read the more fascinated I become. Who knew that these women in their long skirts and corsets were asking the same questions we are asking today? Certainly I had never known how much Victoria’s spiritualist beliefs had influenced the women’s rights movement. She was not the only member of the group who believed that spirits speaking to them from beyond the grave, gave them ideas to help in their campaign. Spiritualism, which had started about 1848, the same year of the first Women’s Rights Convention, attracted many American radicals. Campaigners for both abolition of slavery and for women’s rights tended to gravitate toward the group because it welcomed new ideas and encouraged individualistic thinking. Victoria Woodhull first gained fame, and made a living, by going into trances and predicting what would happen in the future. She believed firmly that spirits spoke directly to her and guided her in her life. Perhaps it was only natural that people who lived unconventional lives and supported unconventional ideas were attracted to the idea that they could find truth on their own with the help of spirits rather than through conventional religion with its strict and unbending rules. 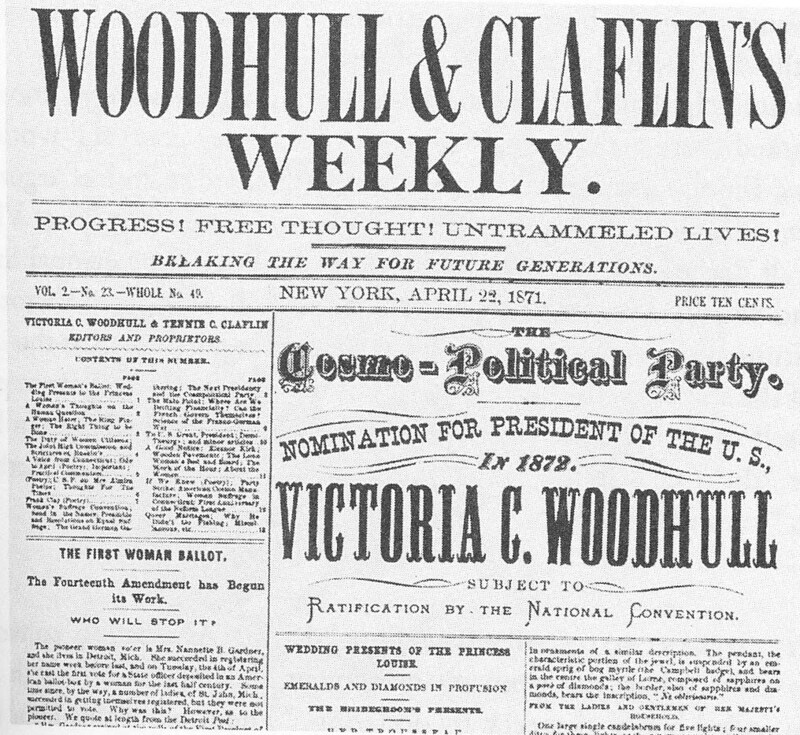 Victoria Woodhull’s presidential campaign raised questions from the time it started. Whether it was legal or not is still an undecided question. Victoria and other members of her Equal Rights party claimed that women were defined as citizens in the U.S. Constitution and there had the right to vote and run for office. She based her claim on the Fourteenth Amendment’s provision that “All persons born or naturalized in the United States, and subject to the jurisdiction thereof, are citizens of the United States and of the State wherein they reside.” Women are persons and are therefore entitled to vote. The argument persuaded some people, but it was especially strong among women, who had never been allowed to vote whether they were citizens or not. Isabella Beecher, sister of Henry Ward Beecher, became a devoted follower of Victoria Woodhull and introduced her to many influential people. With the help of these friends, and especially Cornelius Vanderbilt, Victoria and Tennie started the newspaper Woodhull & Claflin’s Weekly devoted mainly to supporting Victoria’s candidacy. The story of what happened during the 1872 campaign will be continued in my next post.